Your Monograms Local Host® will help you get the most out of your two nights in London. Your European vacation starts with 2 nights in London. You’ll enjoy a guided sightseeing in England’s most famous destination, as well as free time to really get to know the city. Sightseeing includes Big Ben, Westmin-ster Abbey, Buckingham Palace, and St. Paul’s Cathedral. See the sights in “The City of Light” with an expert guide, drive past the Latin Quarter, Les Invalides, Place de la Concorde, Eiffel Tower, the Arc de Triomphe and enjoy a Seine river cruise. Your Monograms vacation package includes helpful onsite support from your expert Local Hosts® both in London and Paris. 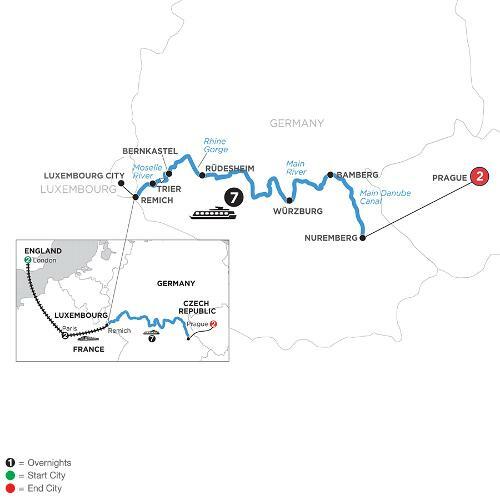 You’ll then travel via high-speed train to Remich, Luxembourg to board your Avalon Suite Ship® for your sce-nic European river cruise along the banks of the Moselle River in beautiful wine country. Take a Guided Sightseeing Tour of Trier, enjoy a guided walk in the charming wine village of Bernkastel, and cruise through the dramatic Rhine Gorge on your way to Rüdesheim. Continue to Würzburg — “Pearl of the Romantic Road”—and then to Nuremberg, with a stop to visit the marvelous sights of medieval Bamberg. Conclude your European river cruise vacation in “The Golden City” of Prague. Carry your river cruise memories home to share and remember for a lifetime as a trip you’ll never forget! You’ll fall in love with London, and you’ll see why Paris is called the most romantic city in the world!